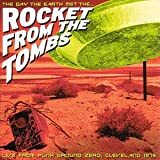 Rocket from the Tombs (or RFTT) is an American rock band originally active from mid-1974 to mid-1975 in Cleveland, Ohio, United States. The band was reconstituted several times with various line-ups starting in 2003. Heralded as an important protopunk group, they were little known during the band's original lifetime, though various members later achieved renown in Pere Ubu and the Dead Boys. Billy Bob Hargus wrote, however, that "The sound of the Rockets is much more ferocious than Ubu or the Dead Boys."